@lizamyers, the noted Vermont artist, tweeted that she was “Listening to Andean music and talking with my students about the Machu Picchu trip next summer!” and it brought something to mind that I hadn’t thought of for many years. In the late 60s, around the time of the first Moon landing, I was working in Switzerland. When I first arrived, I stayed for a couple of months in a large apartment block in Nyon, near the shores of Lac Léman (Lake Geneva to most English speakers). My neighbour, Louis, was a real character. He kept reptiles in his apartment: Poisonous and constrictor snakes, a small crocodile in a tank, a large iguana. The iguana escaped once, and for days was sunning itself on the exterior ledges of the building up on the 10th floor. But that’s not what this story is about. It’s Louis brother who is the protagonist. He was an anthropologist who studied South American culture, but I had the story from Louis. He was working high in the Andes, in a camp with a couple of people native to the area. After a few days, they beat him up and ran away in the night taking everything of value. This was long before mobile phones and GPS, and he was soon wandering lost, without water and, after several days, in a desperate condition. Severely dehydrated, he survived only because he was lucky enough to be found by some Amerindians who took him back to their village and nursed him back to health. He stayed with them for a while, and found himself enchanted by their music. He was a very competent clarinet player–according to Louis, at professional standard–and learned some of the instruments and pieces while in the village. Eventually he recovered, left the village and went back to the city where he started to research the music. But he found that it was fading fast and in danger of dying completely. He decided to do something about it, and started a campaign with the government to save the music and eventually got support. 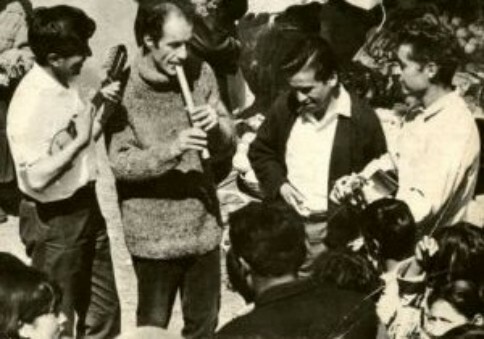 If you’ve come across these strolling groups or heard recordings of Peruvian and Bolivian music, and who hasn’t, you’ll know that this was successful. Now, you’ll hear it all over the world. You can see (and hear) Bolivian musicians in the Paris Metro, in the London Underground and even in China. He formed a group and toured, eventually making a handsome living off it. Louis told me he once hired a truck, filled it with sacks of flour and drove it up to the village where they had nursed him back to life. That’s the story as I had it. Maybe the music wasn’t dying out. Maybe it was, and Louis brother wasn’t its saviour, but I have a 10″ vinyl record of Los Jairas from the 60s and on its cover there’s a group of South American musicians standing round a Caucasian playing a flute, who Louis identified as his brother. And the name matches. Forgive the rambling – and now, back to work!